The ‘static-geometric analogy’ in thin shell structures is a formal correspondence between equilibrium equations on the one hand and geometric compatibility equations on the other. It is well known as a fact, but no satisfactory explanation of its basis has been given. 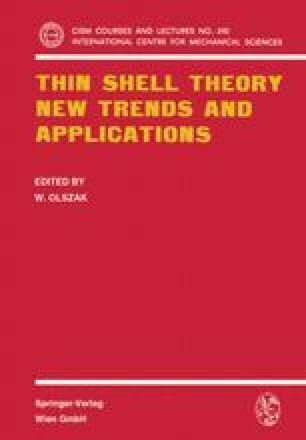 The paper gives an explanation for the analogy, within the framework of shallow-shell theory. The explanation is facilitated by two innovations: (i) separation of the shell surface conceptually into separate stretching (S) and bending (B) surfaces; (ii) use of change of Gaussian curvature as a prime variable. Various limitations of the analogy are pointed out, and a scheme for numerical calculation which embodies the most useful features of the analogy is outlined.